It’s happening – the days are getting shorter, the weather is getting colder and summer already feels like a distant memory. Winter is coming. It can’t be stopped, but this November 1, the cure to our collective winter woes arrives in the form of a joyfilled pop-up experience that is sure to put a smile on your face and some extra pep in your step and on your Instagram feed. 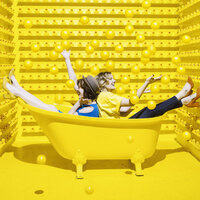 HAPPY PLACE, an interactive, immersive exhibit with larger-than-life installations and multi-sensory themed rooms, is on a mission to spread happiness around the world. Happiness comes in the form of half a million pieces of confetti in the world’s largest indoor confetti dome, a jump into a pot of happiness from the top of a 20-foottall double rainbow, 7-foot stilettos made of a million candies, and the 40,000 immersive flowers of the Super Bloom Room. HAPPY PLACE features 20,000 square feet of whimsical spaces and happy moments. Following massive sold-out runs in LA and Chicago, HAPPY PLACE is making its first international stop in Toronto. Opening its bright yellow doors on November 1, HAPPY PLACE invites visitors of all ages and backgrounds to come together and share the happiness.